FC Porto are one of the most successful clubs in Portuguese football with 28 league titles, 16 Taca de Portugal, 21 Supertaça Cândido de Oliveira, two UEFA Cups, along with two UEFA Champions League and one UEFA Super Cup. Much of their success is down to their brilliant coaching methods and Porto also developed a number of top footballing talents from their youth academy. The Dragões possess a very good scouting system and they unearthed a number of star players during the recent years. However, they always struggle to compete with the financial powers of the big clubs and find it difficult to keep hold of their players when top clubs come calling for them. The Dragões sold players worth £369.02 millions combined in the last five years. Right on this note, here is how FC Porto could have lined up if they hadn't sold their best players. One of the greatest goalkeepers of all time, Iker Casillas started his career with Real Madrid and enjoyed a highly successful career with the Los Blancos. He helped his boyhood club win numerous trophies including five LaLiga titles and three Champions League trophies during his 16 seasons as a professional footballer at the Bernabeu. Casillas won the IFFHS World's Best Goalkeeper of the Year accolade five times and was also included in the FIFA FIFPro World XI on five different occasions. 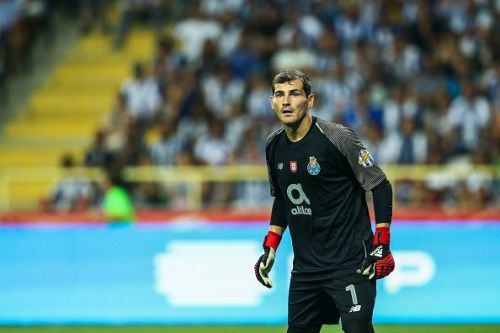 The former Spanish international left Real Madrid to join FC Porto on a free transfer in 2015 and is an integral part of the Dragões since then. He played 96 league games for Porto thus far and won one Primeira Liga title along with one Supertaça Cândido de Oliveira trophy.